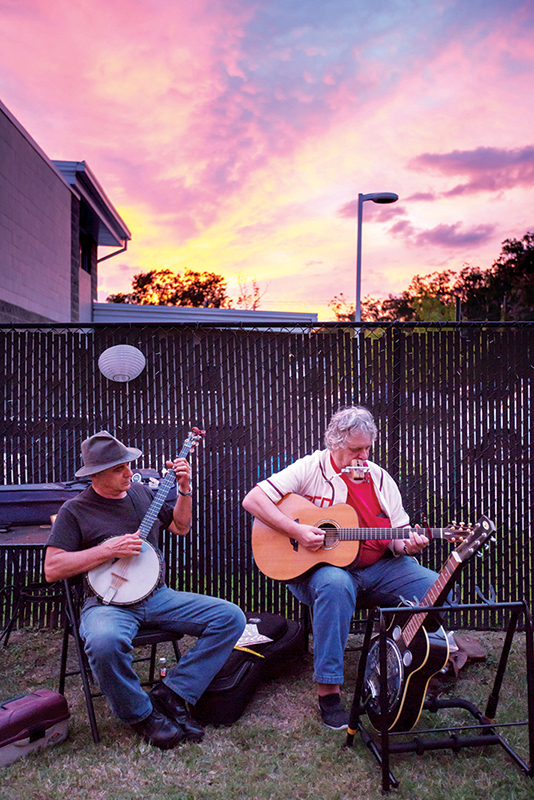 A place that gets its blues and folk jam on is a new mecca for music lovers. Barely inches away from their eager audience, five or six musicians form a circle on the stage, playing a potluck of instruments: flute, trumpet, violin, the tambourine-like pandeiro, guitar and the cavaquinho, which resembles a ukelele. There’s also a piano handy, and the orbit can swell to accommodate even more instruments — an extra flute, a clarinet or set of strings. Someone could get up to sing. There’s always room for one more. The lilting melodies are packed with notes that dance quickly in the air, the rhythms sure and seductive, suffused with a bit of melancholy and nostalgic yearning. That’s the soul of choro — which translates to “I cry” in English — a traditional form of Brazilian bar music that was popular in the early years of the 20th century, long before the country became known for the samba and the bossa nova. The choro was rediscovered in the 1950s and continues to cast its allure. 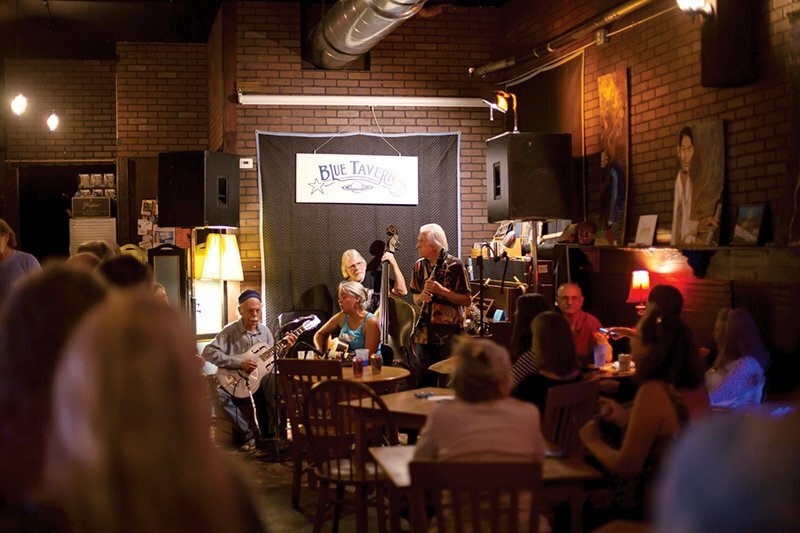 It’s a magnetic draw each week at Tallahassee’s Blue Tavern, a music venue that has become a hub for local blues, folk and world music fans in its first year of business. The modest bar and listening room sits on a nondescript strip of storefronts on North Monroe Street, a couple of blocks south of Liberty Tavern and around the corner from Ology Brewing Company, two of the newer businesses that are reanimating nightlife in a neighborhood overshadowed by the adjacent cluster of bars and restaurants in Midtown. Blue Tavern had, for the three years prior to its 2016 launch, been the Midtown Speakeasy, a dingy, smoke-filled dive-bar known for its copious draft beer selection and late-night punk shows. The transition has been as if someone twirled the knob on an old AM radio, leaping mid-tune from the crunch of a power chord on a cheap amplifier to the flatted fifths of an acoustic guitar and the sweet high lament of a Delta blues ballad, keening off a pre-war Victrola. After Maggie McKeown and her partner Charlie Engstrom, a beloved Tallahassee musician, acquired the space, they gave it a makeover. The walls, covered in faux-brick wallpaper, now resemble a Mount Rushmore of blues legends, with portraits of Lightnin’ Hopkins and Memphis Minnie, painted by local artist Jabare. The booths have been ripped out in favor of tables. The old wooden bar, built by the previous owner, still stands, notably inlaid with river rocks, but the new clientele ›› seems to drink as much wine as beer. The pool table’s gone, making room for dancers and overflow crowds on big nights. This may seem like an unusual place to find McKeown, a congenial former nurse and midwife who came back to Tallahassee, her former home, in 2014 after a long stint in New Orleans. “Like delivering babies in the middle of the night prepares you to open a music venue?” She asks the rhetorical question one evening, as we share a table by the bar’s entrance. As we talk, the young bluegrass duo Jam ’n’ Jelly has begun to play, the melody of Stevie Wonder’s “Isn’t She Lovely?” sounding fleet and airy on mandolin. Well, it turns out McKeown also ran one of the Crescent City’s cultural gems, McKeown’s Books and Difficult Music, for nine years before she decided to leave the faltering retail book business behind. When she closed the store, a staple on Tchoupitoulas Street in the Uptown neighborhood, the New Orleans Times–Picayune published a lament. In addition to the books, she also hosted a far-reaching array of concerts. “McKeown’s edgy musical taste made her store a preferred venue for well-regarded improvisers,” the paper enthused, noting in particular her ear for adventurous jazz and fervent support for local musicians. Certainly, nowhere else hosts marathons of pre-World War I Brazilian music. Live music venues are supposed to be disappearing. The kind of idiosyncratic small bars that once were the ecosystem of cultural life in cities like New York have died off in recent years, or they’ve staved off the inevitable with crowd-funding campaigns, even as prices go higher. McKeown hopes to buck the trend and turn on Tallahassee’s curious ears in the process. Sign up to receive the latest Tallahassee Magazine offers, stories and event invitations directly to your inbox.